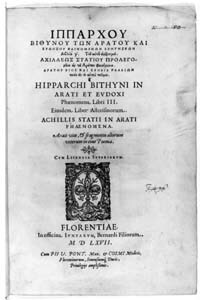 Title page of Aratus and Eudoxus. 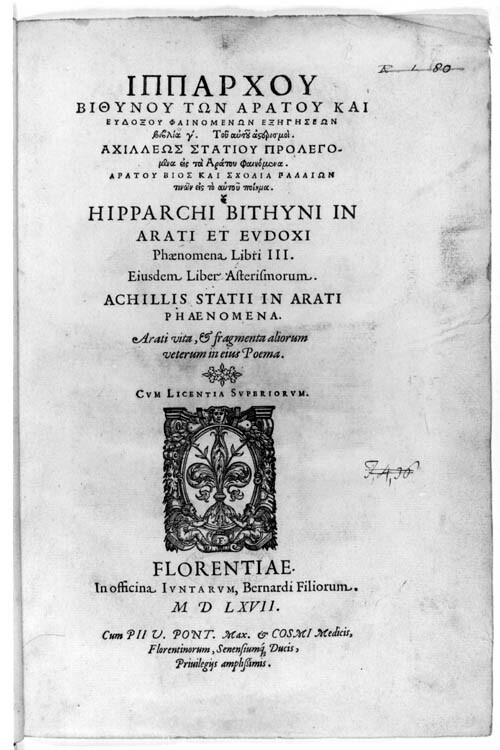 The sole surviving work of Hipparchus (who flourished during the second half of second century BC) is known as the Commentary on the Phenomena of Aratus and Eudoxus. Eudoxus of Cnidus (c. 390-c. 340 BC) produced a work known as the Phenomena, in which he described a calendar with references to the risings and settings of constellations. Aratus (c. 315 - before 240 BC) produced an enormously popular poem, also known as the Phenomena, which utilised Eudoxus' work. Although he wrote many other poems, Aratus' Phenomena is his only extant work. The Phenomena quickly became one of the most widely read poems in the ancient world, after the Homeric poems, the Iliad and the Odyssey. The popularity of Aratus' Phenomena was widespread and long-lived. Various Roman writers translated the work into Latin and it was one of only a very few Greek poems translated into Arabic. The first part of the poem presents a description of the constellations, and lists simultaneous risings and settings of many of the constellations, with the aim of telling the time at night. The second part of the poem is concerned with signs of weather (and may be derived from a work known as On Weather Signs, sometimes attributed to Theophrastus, the student of Aristotle). The appeal of the poem apparently lay in its literary charm, which included numerous mythological allusions, rather than in its astronomical information. The poem was the subject of numerous ancient commentaries, some of which pointed out the various astronomical errors inserted by Aratus. In his own commentary, Hipparchus criticised the descriptions of constellations given by both Aratus and Eudoxus. Aratus' poem, the Phenomena, was not the first to give information about constellations along with weather signs. The final portion of the eighth century BC Hesiodic poem the Works and Days is a sort of farmers' almanac in verse form, incorporating an astronomical calendar based on the appearances of particular constellations and providing information about associated weather conditions.